Located in a quiet neighborhood overlooking Port Royal Golf Course, this apartment is ideal for a relaxing holiday retreat. It is perfectly located close to public transportation and is ten minutes away from Horseshoe Bay Beach, one of the most beautiful beaches in the world.It is also near the fast ferry dock that will transport you into Hamilton, our capital city in just 15 minutes across our beautiful blue water. Historic Dockyard is also just 15 minutes away by bus and you can shop in the Clocktower Shopping Mall, rent a moped, or explore the Maritine Museum or even swim with the Dolphins. The tropical bedroom has a walk in closet with plenty of storage space, and reflects the vibrancy of Bermuda with it's island decor . The apartment is tastefully furnished with a soft leather sleep sofa as well as a leather recliner for complete relaxation after a day of golfing, beaching, or site-seeing. Lie back and enjoy watching TV, a DVD, or listening to music. Enjoy dining or relaxing in the sun on your private patio, or covered porch. You may also want to have a BBQ. There is only a public road separating this apartment from the golf course. You can sit outside and watch the golfers putt into the hole while sipping your favorite beverage. Reverse cycle air conditioning is in bedroom and living room. We also provide four beach towels. The Kitchen has a 30 inch stove with oven, a full size refrigerator, a microwave, a toaster, a coffee maker. The bedroom TV receives local television. The living room TV has cable and DVD. The patio has an outside dining table with umbella and six chairs. It is a great place for a BBQ. Our hosts were great to work with and made it very easy. The apartment was clean and well stocked. The location was an easy walk to the Port Royal clubhouse, grocery store, bus stop and scooter rentals. The 4-5 minute walk to the beach wasn't really a "beach", rather an easy access to the water - not really a place to hang out and enjoy the sun, but great for a quick dip in the ocean. We never saw another person there. Neighborhood was quiet, with friendly neighbors. Thank you for your great review. We are glad you enjoyed the conveniences of our location. Spring Benny Bay is convenient for a quick dip in the ocean after a day of sight seeing .Horseshoe Bay beach is also a short bus ride away for when you wish a beaching day.Do come back and stay again. Thank you for your great review. We are glad you had such an enjoyable vacation in Bermuda and that our apartment had everything that you needed.We do try to anticipate and supply all that is required to make your vacation special. 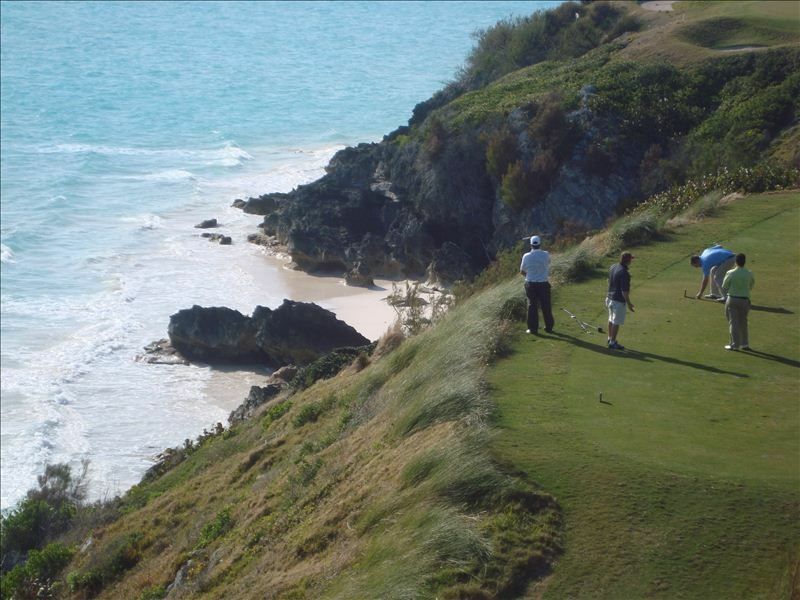 We are happy you were able to play golf at the nearby Port Royal Golf Course. We would love to host you again when you return to Bermuda. Thank you for your comment.Our destination is a great location which provides easy access to world class facilities like historic Dockyard, and several of the best beaches in the world where you can sunbathe,snorkel, and explore. High end hotels and restaurants are also nearby. Our house on the hill has an elevated view and is within 200 feet of world famous Port Royal Golf Course.We're located in a quaint and quiet neighborhood where narrow roads are typical of Bermuda's infrastructure,but our private road enters into a public road which has sidewalks on both sides. Most guests find the walk to the bus stop to take about 5 minutes.Most guests also find the apartment quaint and full of Bermuda charm. Do come back to Bermuda again as 3 nights is not enough time to enjoy all Bermuda has to offer. Very nice property. Walking distance to the bus stops. Loved Bermuda. Rosalyn was quite nice and allowed us our privacy. Thank you for your great review. I'm glad you enjoyed the property. I do like to give my guests their privacy but also like to be available to answer their questions if needed.It looks like your kids had lots of fun.It is convenient having the bus stop so close and there is also a scooter rental store within walking distance. Your stay was too short to enjoy all Bermuda has to offer so you must come back again and explore some more. We would love to have your family stay with us again. This was a cozy apartment conveniently located up a winding road from a bus stop. The latter was a pleasant 5-10 minute walk to Middle Road. In one direction was a bus to the main beaches and Hamilton, and in the other, to Dockyard. About another 7-8 minute walk in the Dockyard direction down Middle Road ( or 1 stop by bus ), is a supermarket. Horseshoe Bay with full facilities, including beach umbrella and chair rentals and a nice outdoor bar is about a 20 minute bus ride. Most importantly to me, the unit had a very comfortable bed, with good back support. There is also a protected out-door patio, as pictured, accessible through sliding doors. It runs the entire length of the bedroom and living room, and has a dining table with a large sun umbrella. The hostess, who lives next door, in the main house was very helpful, pleasant and easily accessible by cell phone. She has also organized a good selection of maps, bus and ferry schedules, activity brochures, and notes on restaurants , directions and places of interest. I am so glad you enjoyed your stay at our apartment. I am especially glad that you found the bed so comfortable, we did invest in a very supportive mattress to provide the best comfort for our guests.I am glad you found the information I supplied so helpful, but it looks like I did not explain where the closest bus stop to Dockyard is located, as you appeared to have walked to the next closest bus stop which was by the supermarket.There is a closer one which is just a 5 minute walk from the apartment. We are glad you enjoyed your private time on the patio and we certainly invite you to return again. It was great meeting you. Keith, Kodi and I enjoyed our stay in Bermuda. The view of the golf course was great. Keith loved the course and wants to go back soon. The apartment was very nice and the grocery store wasn't to far to walk. Blue Water Divers was close by which was convenient. Thank you for your great review. It is great having Port Royal Golf Course right in front of you . We are glad Keith enjoyed playing the course and look forward to when you both return. Prices are based on double occupancy. There is a $25 per night charge for each additional occupant . Prices include all taxes.